The José Guerrero Centre is a contemporary art museum forming part of the Diputación de Granada, and was inaugurated in the year 2000. It came into being with the aim of incorporating a new patrimonial value to the city and province of Granada. It main aims are to conserve the Centre Collection, exhibit it, disseminate it and research into Guerrero’s work, together with the promotion of contemporary art and culture. 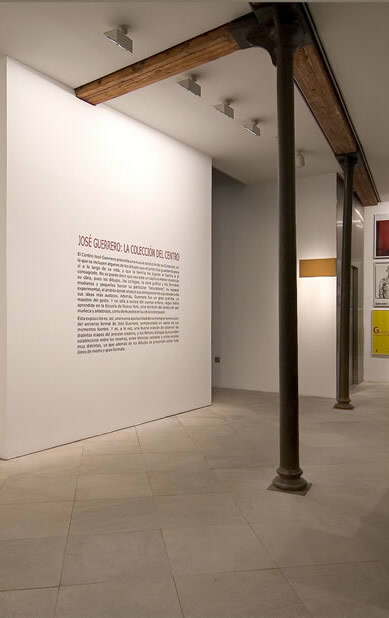 The José Guerrero Centre occupies a building rehabilitated and adapted to all the demands of current museum practice by the architect Antonio Jiménez Torrecillas, under the supervision of Gustavo Torner. The original building was constructed in 1892 by Indalecio Ventura Sabatell according to plans drawn up by the architect Modesto Cendoya. The rehabilitation of the building, given an award by the Granada College of Architects in 2003, centres round the idea of the museum visit as leitmotiv, while also taking advantage of the architectural theme traced by the original building – the exterior opens onto the street, while the interior closes in upon itself, creating a space favourable for aesthetic contemplation. Temporary exhibitions are organized by the Centre using its own assets, and also as co-productions or in collaboration with other museums and galleries. The permanent collection brings together the tasks that fulfill the inherent functions of a museum institution – the conservation, cataloguing, restoration, research, dissemination and exhibition of its assets. The José Guerrero Centre offers itself as a space for participation, reflexion, public action and interrelation between different artists, collaborators, curators and audiences. It therefore promotes activities such as lecture cycles, concerts, film, workshops, publications, guided visits, etc., in order to fulfill it educational, training and research functions. Different activities take place in the Centre in relation to the visual arts or other creative areas that wish to take part, offering a panorama of contemporary creation – cycles of concerts of modern music, workshops in collaboration with different levels of educational establishment, audiovisual shows, lecture cycles, and the publication of catalogues and artist’s books, all of which make the Guerrero Centre a diversified cultural catalyst set into the fabric of the city. The José Guerrero Centre carries out a teaching programme designed to disseminate not only the José Guerrero Legacy, but also the temporary exhibitions, which are analyzed for a broad public, with particular emphasis on school children. Historical reviews with a strong educational component. Thematic exhibitions on current Spanish and international art. Monographic exhibitions on Spanish and international artists. Special commissions for artists whose starting point is Granada as a source of inspiration. Travelling exhibitions on José Guerrero on provincial, national and international levels. The Centre’s bookshop offers for sale the catalogues and art books published by the Diputación de Granada as a result of the exhibitions held in its rooms and the rooms of the José Guerrero Centre, as well as educational material and other collections concerning other fields of knowledge. The José Guerrero Centre’s collection consists of forty works on canvas, twenty on paper, a personal archive and an art library. At all times the Centre will maintain a representative selection of the collection in one or more of its rooms, however its presentation will be dynamic in nature. To have at the permanent disposal of the general public a selection of the works from the Centre Collection in one or more of its rooms. To reply to requests for reservation of guided visits at most five days after receipt of the request. To provide information on activities at most five days after receipt of the request. To provide information on the publications available in the Centre bookshop at most five days after receipt of the request. The number of annual exhibitions of the Centre Collection and its calendar. Replies to requests for applications to visit and information made within the five day maximum and percentage of total. Members of the public who consider that the José Guerrero Centre has failed to comply with the commitments expressed in this Service Charter can write to the management of the Centre by letter or by e-mail. Complaint forms are also available.